Mr. Byrne has been representing disabled persons in their claims for Social Security disability benefits since 1982. Mr. Byrne has represented claimants: at the initial claim level at the Social Security Administration District Office, at the reconsideration level at the District Office, at the hearing level before the Administrative Law Judge at the Office of Disability Adjudication and Review, in appeals to the Social Security Administration's Appeals Council and in appeals to the United States District Court. Mr. Byrne has represented disabled persons in their claims for disability benefits for disabling conditions including: peripheral neuropathy, lower extremity fracture, disabling conditions of the knee, liver diseases, including cirrhosis and hepatitis, heart conditions, lung diseases, including chronic obstructive pulmonary disease, (COPD), back injuries, degenerative disk disease, lumbar radiculopathy, disorders of the neck, cervical radiculopathy, impaired vision, diabetes and its complications, including blindness, head and brain injuries, impaired vision, stroke, heart disease, osteoarthritis, rheumatoid arthritis, multiple sclerosis, auto-immune neuromuscular disease, cancer, fibromyalgia, anxiety, depression, personality disorders, obsessive disorder, bipolar disorder, schizophrenic disorders, loss of IQ, memory loss and concentration impairments. Mr. Byrne also represents disabled children and disabled widows in their claims for Social Security benefits. Mr. Byrne has experience in representing disabled persons who were working part-time at the time that they filed their Social Security disability claims. 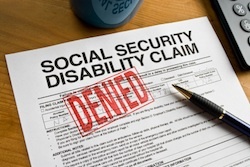 Mr. Byrne has represented disabled persons in their claims to re-open and reverse past denials of claims by the Social Security Administration. Mr. Byrne has experience in: representing disabled persons who received workers' compensation benefits and/or long term disability benefits from private or government plans in addition to their Social Security disability benefits, and in the application of any relevant offset(s) of benefits resulting from the receipt of disability benefits from multiple sources.